We’ve all been there: your favorite band is in town but somehow tickets have sold out before you even knew they were coming. There’s nothing like that downer when you realize, dammit, I’m at home and the Alabama Shakes are playing right down the street and there’s nothing I can do about it! Well, I’ve got just the ticket (sorry, couldn’t resist) for you, music-loving tech geek. It’s called EVNTLIVE and it’s here to ensure that you don’t ever miss a concert again… If you’re willing to watch it from home. Released just six days ago and currently in invitation-only beta, EVNTLIVE is the next big thing in concert viewing. It’s number one service is to provide live-streaming of (yet to be named) concerts and a “library,” if you will, of previous concerts that fans can access any time. That means more awesome live performances, accessible with just the click of a button. How much will it put me back? Much less than an actual ticket, that’s for sure. Some of the concerts are going to be free or cheaper with sponsorship, some will be free without sponsorship, and the rest will be on a sliding scale. Considering the fact that tickets for popular artists can shoot up as high as $400 bucks these days, that’s a damn good deal. EVNTLIVE also wants to provide you with an “All Access Pass” to your favorite concerts, supplying you with information about the artist while you’re watching them perform live. Get to know all the biographical info behind that aching love song and chat with other fans while you listen to your favorite singer croon away. The CEO behind EVNTLIVE is a “rock star” in her own right, at least when it comes to the entrepreneurial world. Judy Estrin already has three successful tech companies under her belt: Bridge Communications, Network Computing Devices, and Precept Software. One of Fortune Magazine’s top 50 most powerful women in American business, Judy sat on the board of FedEx, Sun Microsystems, and Rockwell Corporation. She’s currently on the board of Walt Disney and Packet Design, Inc., and is on the advisory councils of Stanford’s School of Engineering and Stanford’s Bio-X Initiative. Where did this woman find the time to develop a startup?? While nothing can ever compare to actually being in a club or concert hall with your favorite band, I have to say that EVNTLIVE is a damn good consolation prize. 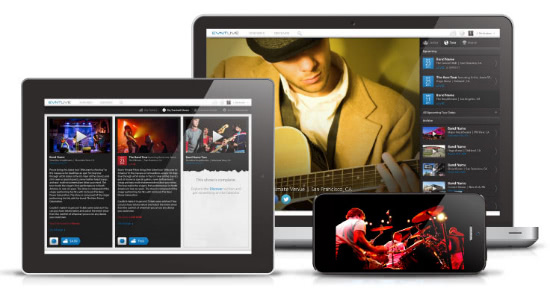 It’s a great idea, with the potential to be the YouTube of live-streaming concerts. With a team like that behind it (and we all know how important the team is, don’t we founders?) I don’t see how they can go wrong.